The Caucasian Brown is a composite of the Lesser Caucasus breed, Swiss Brown, Kostroma and Lebedin. The Caucasian Brown was officially recognized as a breed in 1960. The Caucasian Brown spread to Georgia and since 1950 has supposedly been crossbred with the Brown Swiss (USA). The Caucasian Brown adapts well to harsh climatic conditions and poor pasture. They have a high fat content in their milk and is used for local Swiss cheese. They are bred primarilly for milk, but also for beef. NOTE: As of 2018, the Caucasian Brown is not listed by Armenia in the DAD-IS database. However, Grey Caucasian and Lorii are both listed. My Daily Cow® Azerbaijan and Georgia and read about other Azerbaijan and Georgian cattle breeds. 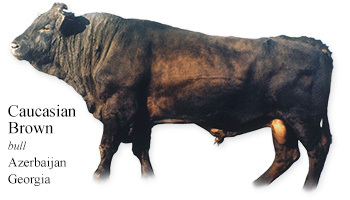 The Cow Wall® A-Z Cattle Breed Picture Reference to see other breeds of cattle in the world. The My Daily Cow App gives you A Cow a Day and a Reference Guide into the World of Cattle. Please buy the My Daily Cow App. Help build The Cow Wall and support free after-school programs and this Kranky Kids website of free materials for students and educators.